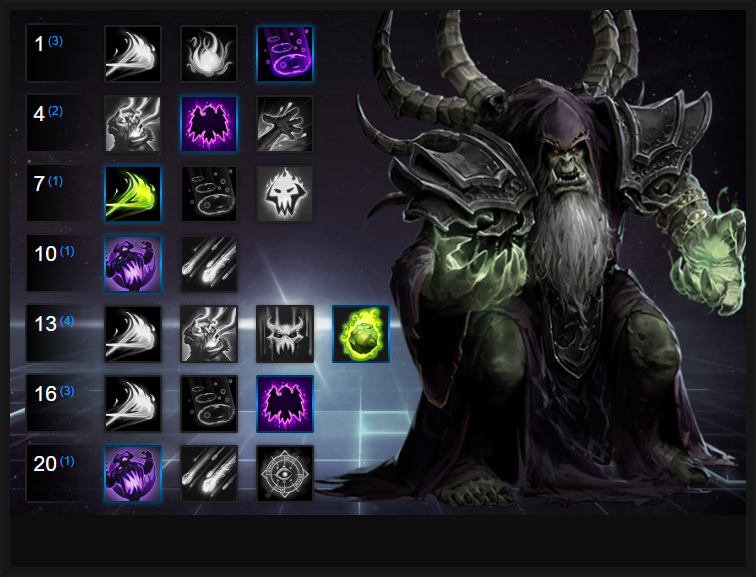 In this Gul'dan Build Guide, we provide an overview of his strengths, abilities, talents and matchups. Gul'dan is a Hero I've quickly fallen in love with and has gone right to the top of my choice of first picks. Although his kit shares similarities with others in the Nexus (Life Drain is similar to Leoric's Drain Hope, Corruption similar to Dread Orb and Fel Flame similar to Medivh's Arcane Rift) his kit combined is surprisingly powerful. His Trait, Life Tap, provides incredible sustain when combined with Life Drain and allows him to not only survive for long periods of time, but reduces almost all need for him to return back to base. What's also fantastic about Gul'dan is that not only does he have sustain that's invaluable on objective based Battlegrounds, but his Ultimate ability - Horrify - is incredibly strong. The fear is not only disruptive, but ensures enemy Heroes are displaced enough that some are always easy pickings. Finally and due to the nature of team fights in Heroes of the Storm, Corruption is more than capable of applying a high amount of damage over time pressure, especially when paired with Fel Flame. Just be careful against Heroes that can slow, root or stun - Gul'dan has no means of escape. 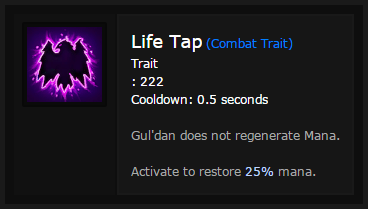 Life Tap (Trait) - Arguably one of the strongest Traits in the game, Life Tap when combined with Drain Life provides Gul'dan with near permanent sustain. At a cost of 25% health, Gul'dan will restore 25% mana. His Trait can also be activated as many times as you like, allowing you to quickly regain all your mana. Unsurprisingly there's a great deal of risk involved with Life-tapping. Doing it too much will leave you highly vulnerable, especially if Drain Life is on cooldown. If there's also an enemy Nova or Zeratul on the opposing team, pushing your luck when it comes to regaining your Mana could see you killed very quickly. If you can, only try to Life Tap when you're full health, or when Life Drain is available so that you can quickly regain your health. Please note you cannot kill yourself by using Life Tap; you will simply stop at 1 health. Fel Flame (Q) - With a cooldown of 1.5 seconds, Fel Flame is a high damage wave attack that you can effectively use repeatedly. At a mana cost of 75 and with only 500 mana, you will however quickly run out if you use it too often. The best use of Fel Flame is when you can impact multiple targets as it will pass through all those in a line. If you can, you should also be using Fel Flame as your primary means of "poke" as its low cooldown and range allow you to fire it off quickly and often to ensure objectives can't be interacted with. Drain Life (W) - An ability I adore, Drain Life returns a high amount of health back to Gul'dan. As a channeled spell you cannot move during it and you can be interrupted by stuns. Despite that, over 3 seconds it can return well over 900 health and considering the synergy it shares with Life Tap, can ensure that you rarely need to go back to base. I will add that due to its cooldown, you really can't afford to waste Drain Life and while its use against minions in lane is easy, it's somewhat challenging against enemy Heroes due to how much players move. It's best to use it when an enemy is distracted or when if they do retreat, you'll get most of the duration. Drain Life can be used on minions and mercenaries. Corruption (E) - As a slow moving projectile, Corruption deals reasonable damage over time. It can effect multiple Heroes at once and if you do manage to hit several, will pressure any healer. Considering Corruption can also stack 3 times (the energy blobs fire three bouncing projectiles) it's damage can be significant if you do land them all. In most circumstances you won't, but the potential is certainly there during busy team fights. If you can, try to always land Corruption on high value targets or the enemy Support to ensure maximum pressure. Rain of Destruction (R) - While its radius might be large, the fact the damage is random makes Rain of Destruction a strange ability. In comparison to the guaranteed area damage of Tyrande's Starfall, it seems odd that it is in fact random. While I've had some use out of it, the fact you can't ever ensure who gets hit makes it somewhat unreliable when you really need to bring guaranteed damage. On the plus side, it's fantastic at displacing enemies to ensure they're under pressure should they choose to fight in its radius. For maximum damage, take Echoed Corruption. You need 30 stacks of Corruption to cap the quest, but once you do your Corruption will bounce backwards on its third strike. In close quarters, it allows for really good damage. Also be aware that each bounce that hits a target contributes towards the quest. By level 9 you can complete it easily. Variable: Gul'dan lives and dies by his Drain Life and its effectiveness. It's paramount to his survivability and Life Tap. By increasing the cast range by 25% thanks to Glyph of Drain Life you not only give yourself a greater ability to use it, but a greater ability to have it complete when targetting someone without fear of them escaping its range. Gaining even more mana is never a bad thing and Improved Life Tap granting 35% mana return can be significant. It allows you to sustain yourself longer and use your trait less during team fights. It also means that you don't have to use Drain Life quite as often: win-win. Variable: Health Funnel can be particularly useful, especially with Glyph of Drain Life. If someones low health, using Drain Life of them will gaurentee you shave 6 seconds off your Drain Life cooldown, allowing you to use it again quickly. By default, Corruption has a lengthy cooldown and yet it's key to Gul'dan pressuring opponents. Bound By Shadow allows him to significantly decrease its cooldown by 1 second every time he lands Fel Flame on an enemy Hero. It might not sound a lot, but in a team fight and if you repeatedly hit multiple enemies, you can ensure Corruption is always available. An undeniably strong Ultimate ability, Horrify is invaluable in a team fight - during an engage or when a fight is breaking out. If you can, try to ensure you hit as many targets as possible and be sure to immediately attack the nearest, squishiest target. Having an instant heal for 30% of your maximum health is amazing and considering Healthstone is on a 60 second cooldown, it'll always be available for a team fight. Not only is it invaluable for synergizing with Life Tap but in a pinch it absolutely will save your life. Variable: Dark Bargain is particularly useful as it boosts Gul'dan's health to almost 2100. That's a huge amount for a mage (Li Ming only has 1200) and provides you with lots of surivability. Darkness Within effectively provides permanent access to a 25% increase to your ability power, it scales with Life Drain and all your other offensive skills, allowing you to spike easily. If you used before Life Drain, it'll also convert a greater amount of incoming health. Alternatively, use Life Tap just before Horrify for extra AOE damage. Haunt is an amazing talent that not only increases the duration of his Horrify fear by 1 second, but also causes Vulnerability on all targets increasing damage against them by 20%. This is enormous and allows you and your team to deal huge damage in a very short window. Variable: If you're against a dive heavy or mobile composition, take Demonic Circle. It's an instant teleport that will get you out of any harmful situation instantly. These Hero Threat Levels (1 being lowest threat and 10 being highest threat) are to help you determine which enemy Heroes can give you a headache. For the Heroes listed here, take extra care as they're particularly dangerous for Gul'dan. Lunara: Her mobility, nuisance poison and vision make her a challenge for Gul'dan. You'll not be able to maintain your Life Drain and she can easily run rings around your spells. Tracer: She's super fast, can Blink out of your Life Drain and deal huge damage to you with her Ultimate. Thrall: His root, ranged poke and self healing are very difficult to deal with. Even with your range, if he has taken Sundering and flanks you, you'll die quickly. The Butcher: Onslaught and Lamb to the Slaughter can destroy you near instantly. The best you can hope for is to use Horrify at the point of impact before running away. Illidan: Evade, self healing, mobility, damage - he's a headache you just can't get rid of. Greymane: He has the burst potential to kill you near instantly if he switches to Worgen form, while having his Ultimate ability ready. This list of tips and tricks are just a handful of things we think will help your Gul'dan play. We'll continue to add to the list as required and if you have any tips you'd like to share, let us know in the comments below and we'll place them here. 1. Life Tap is invaluable for providing you with mana and when paired with Life Drain, ensures you never need to go back to base. Use this to bully lanes. 2. You can use Life Tap repeatedly but you can't kill yourself if you're too low health. 3. Don't Life Tap in a team fight if you're already low health. One DOT or basic attack can finish you off, making you an easy kill. 4. If you can, try to always save your Fountain for a team fight rather than when in lane. Rotating Life Tap > Drain Life should be all you need to sustain yourself. 5. Fel Flame has a very low cooldown, it's also cheap on mana. Use it repeatedly in a team fight, and use it to clear waves quickly. 6. Fel Flame doesn't have a huge range so don't over-extend just to use it. Position yourself so that you're at maximum range when using it. 7. Drain Life can be used on minions to heal Gul'dan for a significant amount. 8. When you cast Drain Life, it actually stretches once it's attached to a player. Even if they move out the original radius, it'll usually remain connected until they move very far away. 9. You can be interrupted when casting Drain Life. If you are, it will still go on cooldown. Use it when your opponent(s) have used their stuns. 10. Corruption can take some practice to aim properly as it has 3 strikes which are cast our from Gul'dan. Try to lead your shots by predicting where the enemy will be. 11. When you have Horrify, save your Corruption so that when the enemy runs in a straight line, you can cast it at them to gaurentee all 3 strikes. 12. Horrify is incredible when a team-fight is already in progress and the enemy team weakened. Use it to scatter them to finish them off. 13. Remember that as a mage, you have a damn sight more sustain than any other. You can go toe-to-toe with most Heroes and come out on top, especially after level 13. 14. Try to land Corruption on as many targets as possible for maximum damage over time - if you can, it's also worth using Corruption against a target that's rooted or stunned to gaurantee the stacks. 15. Horrify is as much your escape tool as it is to disrupt a team during a fight. Save it for the right moment and don't be afraid to save yourself by using it, should you be caught alone.